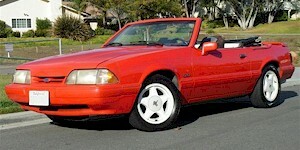 1992 There were 2193 Special Limited Edition "Feature" or "Summer Special" LX 5.0L convertibles produced in mid 1992. They were all painted Vibrant Red with a white interior and top combination. These cars had special rear decklid spoilers; color keyed side moldings, mirrors, door and window trim; and white wheels. The Superior Wheel Company in Kansas created these wheels for the Feature car by applying baked-on opal pearlescent paint over silver. The interior featured white leather seats with black piping, black carpet, an ebony dash, and a black Lori cloth headliner. The "Feature" option was an additional $850 over the base LX price. The VIN numbers of these cars were not sequential but started the same with 1FACP44E*NF (so far serial numbers we found are 156184 and 161282). 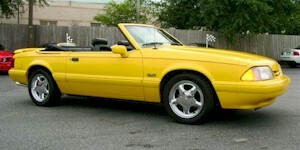 1993 There were 3003 Special Limited Edition "Feature" LX 5.0L convertibles produced in 1993. A quantity of 1503 were painted exclusive Canary Yellow with either a black or white interior and top combination and chrome wheels. Another 1500 were painted Vibrant White with a white interior and top combination and white wheels. These cars had rear decklid spoilers and 16-inch 5-spoke Pony wheels. The front seat headrests and floor mats have a Pony embroidered on them. 2000 Offered in the Spring of 2000 was the GT Spring Feature. 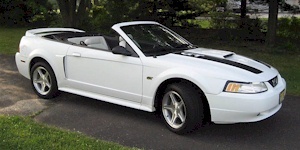 It consisted of two black hood stripes with GT lettering, black Mustang bumper decal inserts, 35th Anniversary hood & side scoops, and 17x8 inch 5-spoke wheels. They where available in Performance Red, Black, Silver, Crystal White, and Zinc Yellow. 3091 Spring Editions were built.